"Omg guys ur gonna freak!! I just booked one of the biggest projects and I've always wanted to work with this director cnt say but will soon!" University of Vermont graduate Jon Kilik (Class of '78) is an Academy Award nominated film producer and winner of two Golden Globe awards — 2007 Best Picture for "Babel" and 2008 Best Foreign Film for "The Diving Bell and The Butterfly." 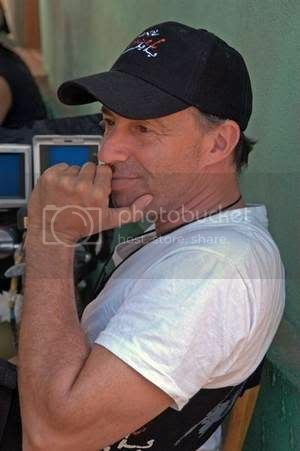 He has produced over 30 films that have been nominated for 26 Academy Awards. Among them are Spike Lee's "Do the Right Thing," "Malcolm X," "25th Hour" and "Inside Man"; Tim Robbins' "Dead Man Walking"; Gary Ross' "Pleasantville"; Oliver Stone's "Alexander" and "W."; Alejandro Inarritu's "Babel" and "Biutiful"; Julian Schnabel's "Basquiat," "Before Night Falls," "The Diving Bell and The Butterfly" and the controversial "Miral" that opened this week in New York and Los Angeles. Jag tror verkligen det här kommer bli bra eftersom väldigt många som jobbar den här filmen är oscar nominerade. Som ex: Gary Ross som regissör, Larry Dias som set decorator och Jennifer Lawrence som Katniss. Gå till AnOtherMagazine för att se bilderna. Liam Hemsworth, who is best known for starring opposite Miley Cyrus in The Last Song. David Henrie -- One of the stars of Wizards of Waverly Place and a regular on How I Met Your Mother. Set to star in the CBS pilot for The Assistants. Robbie Amell –starred as Fred in the recent straight-to-DVD Scooby Doo! movies and was one of the stars of Nickelodeon's True Jackson, VP. Drew Roy, a Disney Channel and ABC Family actor (Hannah Montana, Greek) who is one of the stars of TNT's high-profile sci-fi series Falling Skies. I en ny intervju med Emma Roberts, MTV's Hollywood Crush frågade henne om hon hade varit aktuell för rollen som Katniss. 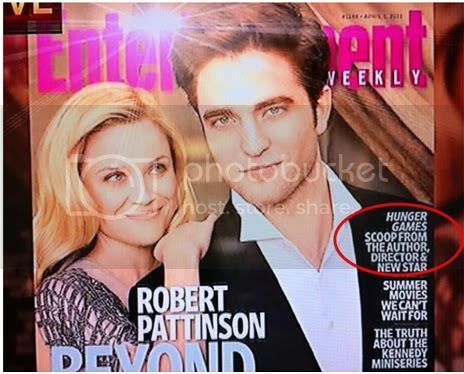 Robert Pattinson var på the cover av EW och i intervjun så frågades han om vad han tycker om The Hungergames. 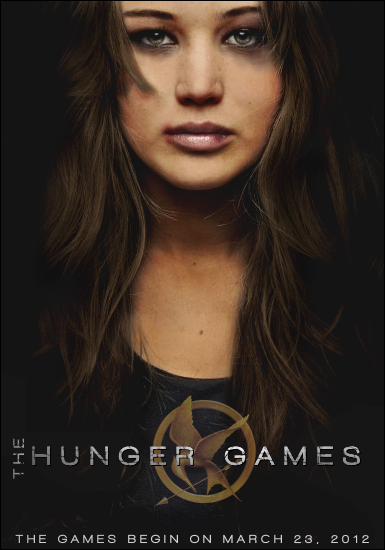 EW: There's been a lot of Twilight-like excitement about the casting of The Hunger Games. Do you find it amusing? Do you know the books? Pattinson: I sort of came across it last year, and I didn't realize it was the most enormous thing in the world. It's good! It will be a good movie. 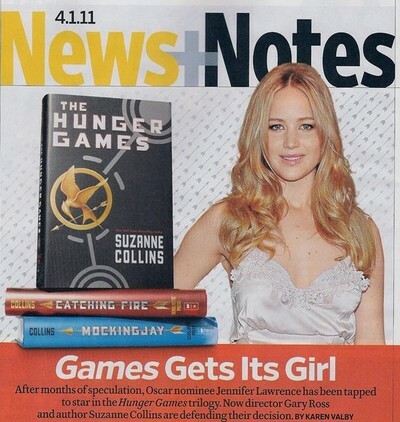 Jennifer intervjuades av Ryan Seacrest nyligen och hon talade lite om the hungergames. “The books are so incredible. They have a huge fan base which I’m apart. I read them awhile ago, and was obsessed with them.” Jennifer reflects on the taxing audition process for “The Hunger Games” saying, “I had to audition for the part, and I did this really long improve with Gary Ross, the director. It was the most terrifying thing in my life! 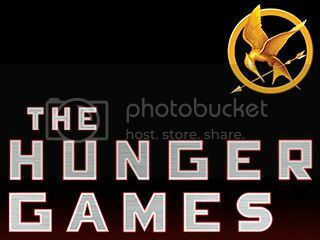 I haven’t been nervous at an audition in so long, but that one got me.” She continued, “from now on when I come out of auditions crying it must be a good sign!” Look for “The Hunger Games” wide release on March 23, 2012. CleverTV: Callan Mcauliffe som Peeta? 1 år tills filmen kommer ut! Idag är det en dag tills filmen kommit ut! Jag kan inte fatta att det är ett år kvar. Jag har väntat på denna film ända sen det offentligörades att den skulle komma. Om du tycker tiden går för långsamt har HollywoodCrush gjort en lista på saker du kan göra för att tiden ska gå fortare.